After Oppo announced their sub-brand Realme which further created the Realme One, and this closely resembles Xiaomi’s Redmi. 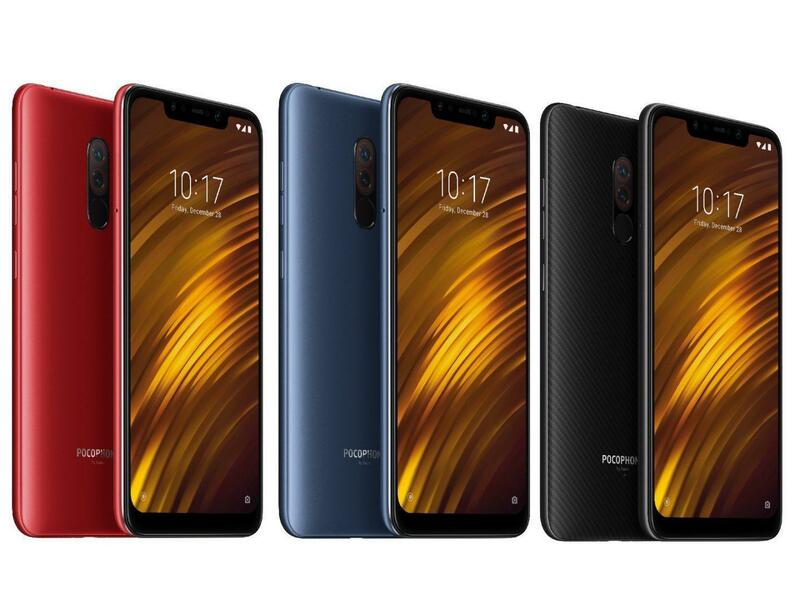 So, Xiaomi went ahead and created a new sub-brand called Poco, and the company has made its official debut by unveiling the Poco F1, which will redefine the premium budget segment once again and may start a price war as it has a lot to offer (BBC reported). Also, remember Huawei also has a sub-brand called Honor which recently also tried something similar with the launch of it’s Honor Play. 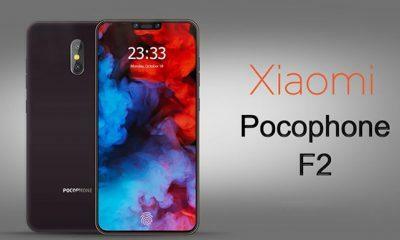 Now getting back to the Poco F1, its design is typical Xiaomi cloning the iPhone X and this around we have an iPhone front facia, and rear is like a OnePlus 6 without glass, which is the main competitor or target of the Poco F1. Because Poco talked a lot about how it’s device outperforms the flagship OnePlus 6 in every way by costing nearly half of the price, which is at just 20,999 INR. (Note: Global variants will have more LTE bands as answered by POCO. 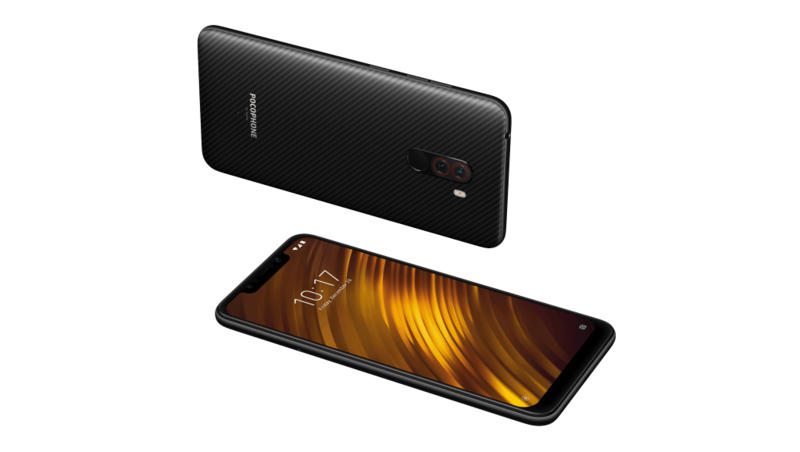 The Xiaomi Poco F1 is powered by top of the line Qualcomm Snapdragon 845 which is an octa-core chip and rival’s Apple’s A11 bionic found in the iPhone X and is the most powerful mobile CPU. GPU duties are handled by the very powerful Adreno 630 which is the flagship GPU of Qualcomm, means playing PUBG in full graphics checked. The CPU and GPU use cool liquid technology which helps to keep the temperatures under control. Now paired with this is 6GB RAM or 8GB RAM along with 64GB, 128GB and a whopping 256GB variant are also available, which is insane when you find at the price it comes for below. The front is dominated by a 6.18-inch IPS LCD full-HD+ panel which sports 18.7:9 ratio and has a notch display design, which can be hidden with a simple toggle. 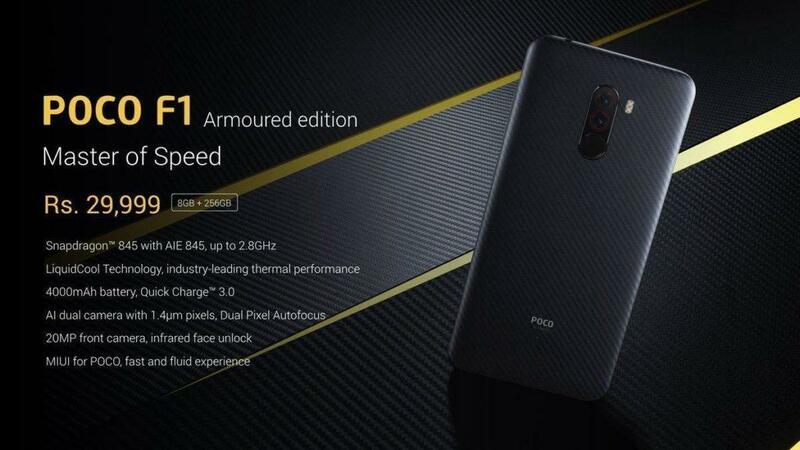 Apart from regular metal design, the Poco F1 also comes in a Kevlar (used in bullet-proof armour) back panel which is a very durable material, this isn’t something new as we have seen this way back in 2012/2013 with the Motorola & Verizon Droid Razr’s, but good to see someone bring back that material again. Face-unlock is also here, and this one doesn’t only rely on the phone’s front camera, but also uses the assistance of Infrared sensors for face recognition which also works in a dark environment as well. The Poco f1 comes with a hybrid sim solution, means two slots one for the sim card and another one for sd-card or both sim-cards, but then there’s no place for dedicated sd-card. The handset features Dual-Stereo speakers (Earpiece) with a dedicated Dual-Direct Durac for HD Audio. As being an affordable flagship, we have a Dual-camera setup with some pretty insane specs for the camera, starting with the two sensors one is a Sony IMX363+ 12 megapixel primary sensor at f/1.9 aperture with bigger 1.4 micron pixel size which will help to capture more light, when the sun goes down, while the second one is just a 5 megapixel depth sensor. The camera also posses several AI capabilities, HDR support, portrait mode and also focusing is handles by advance Dual-Pixel detection system for faster-focusing speeds. 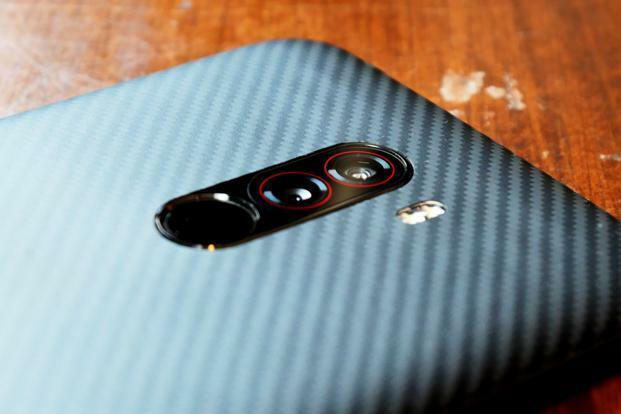 On the front, a monstrous 20 Megapixel snapper does the job for selfies, and you have your regular filters and portrait mode on the front as well. 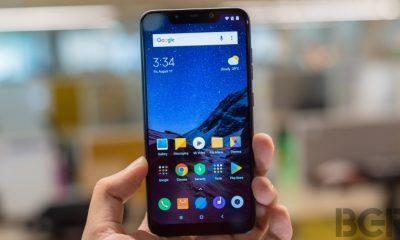 Poco f1 uses MIUI for Poço which is a much more refined and tone down version of MIUI and is somewhat similar to the Stock Android interface with some nifty additions and customizations. 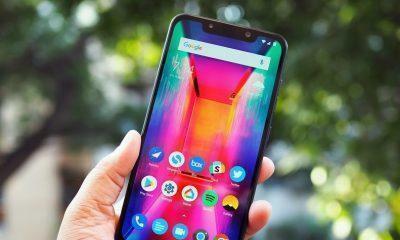 However the big thing here Poco touted is the implementation of its TurboCharge engine which will ensure 20% smooth animations and framerate along with most important optimization of apps which will boost the start-up of all apps, improved fore-ground app so when you switch between apps, it will always start from where you left and so on. Apps are categorized as colors, so when an App’s icon color changes you won’t get confused. The company has also decided to host its MIUI for Poco launcher app on the Google Play Store so whenever an update for the launcher, it will show up in the Google Play Store for everyone. Another thing about software is updates, and Poco has promised to deliver the newest flavor of Android which is Android Pie 9.0 Update by the end of 2018, and you will also get regular monthly security updates as well, which remains to be seen, how long the company follows its promise. The smartphone also supports Project Treble. Xiaomi has also said that unlcoking the bootloader will not void the warranty and the kernel source will be available on Github after 27 August. Good news is that the battery capacity is quite large and as per 2018 standards at 4000mAh but also you will get Qualcomm Quick Charge 3.0 (18W- 5V-3A, 9V-2A, 12V-1.5A) this time instead of 10W charging which is found in most of Xiaomi smartphones. The earset also comes with a dedicated DAC built into it for more enhanced music experience via earphones. With such an aggressive price, the Poco F1 is a true flagship killer, and it almost is on par with the OnePlus 6 which is its main rival. The handset goes on sale on 29th August @12pm IST, exclusively on Flipkart and also on mi.com and will be an online-only phone. While in global markets the phone is set to launch on August 27th in France, Indonesia, and Hong Kong; expect pricing similar to the Indian variant. Launch day offers to include a discount of Rs. 1,000 when you pay with HDFC Bank’s Credit as well as with Debit cards. Also, Jio users will be treated with an insane 6TB of Data and also cashback worth Rs.8000 of course T&C applied. If you have any question regarding POCO F1 then you can ask them in the comment section below. Are Smartphones More Vulnerable to Cyberattacks in 2018?